Don’t Miss Out On Our 2018 Summer Season! Year after year, Rainbow Stage produces amazing shows. Don’t miss out this year by purchasing your Season Tickets today. They make a great gift for family or friends. Order Online or call us to purchase Flex Tickets (you can buy the tickets now and pick the date to attend later). Join us for Breaking Up Is Hard To Do and Beauty And The Beast, two great shows that are sure to entertain. NEW* Exchanges can be made up to 48 hours prior to the originally purchased date for a $5.00/per ticket fee. Exchanges made less than 48 hours are subject to a $10/per ticket fee. 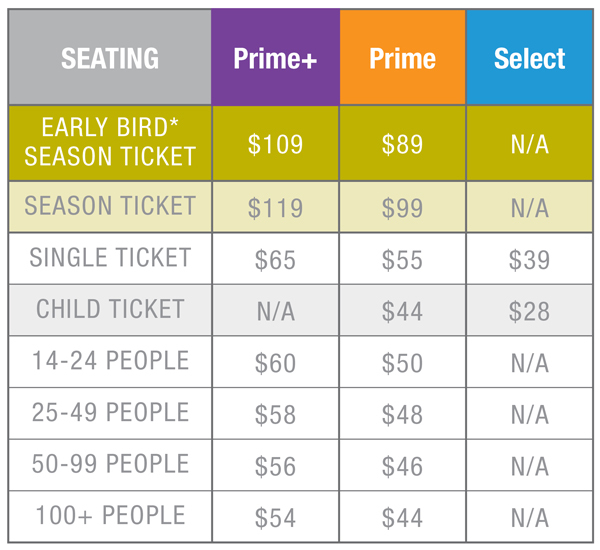 Season Ticket Holders receive free exchanges up to 48 hours prior to performance. When you become a season ticket holder you are eligible for a discount on A Chorus Line presented by the WSO with support from Rainbow Stage.